Lately I’ve been spending more time outside than usual. It could be because I’m finally healed up from my injury and can run again, or because it’s a place where I feel a deeper connection to life. The answer is probably some of both. I’ve just returned home to Colorado from a solo road trip through Nevada and to the Sierra Nevada in California, during which I experienced a wide spectrum of events that were both good and bad. They shared common themes, however, in that they helped bring me closer to my life and its most important things. Coming off of a dizzying high from the circus spectacle known as the Summer Outdoor Retailer show in Salt Lake City, Utah, I decided to car camp in nearby Elko, Nevada to reboot and explore the Ruby Mountains. I’ve been interested in this range for quite some time, and now seemed like the perfect chance to check it out. I found a flat patch of ground upon which to camp next to a bus-sized RV. These people were true ‘glampers.’ They had all the luxuries of life in that RV, and here I was with my 2005 Xterra, preparing to wiggle myself between my Brute cooler and newly purchased Boardworks inflatable SUP (among other bags of gear) to sleep for the next two weeks. Later that evening I formally met the RV owners, Blain and Paula. These folks couldn’t have been any nicer. If I needed anything at any time, I could simply go knock on their door. And by the size of their RV, I’m sure they had it. Blain built Paula and I campfire to help keep us warm in the chilly night air. As we watched the flames dance on the timber, Paula asked if I had heard about the missing boy in the Rubies. At first I thought she was pulling my leg, but then I came to realize this was a true and ongoing story. About 10 days before my arrival, a 20-year-old boy named Jacob went missing. He was scouting spots for hunting season and never returned home. I went to bed that night thinking about him. I wondered where he could be and if he could still be alive. I wondered if I might unexpectedly find him on my run the next day. The next morning I pulled into the trailhead parking lot where there was another bus-sized RV stationed to provide aid for search-and-rescue workers. I got out of my truck feeling a bit out of place and out of sorts. Should I be here? I thought. My intention was to come to the Ruby Mountains for an exciting day of exploring. I felt guilty for wanting to be in positive spirits when a tragedy was in progress. Screenshot of a TV news report about Jacob Beetler. All images courtesy of Gina Lucrezi. A woman walked over to me and asked where I was headed and gave me a piece of paper with Jacob’s picture, name, and a brief description of what he was last seen wearing. As I ran off, I thought about what might have happened to him. He was a hunter, so he spent time in the mountains, and in these mountains. Did he slip and fall off a cliff? Had he been attacked by something? Every time I go into the mountains I’m confident I’ll come back. I’m fairly sure of myself and my capabilities. Everybody is, right? I’m sure Jacob was confident that he would return home from his scouting trip as well. Knowing that there was most likely a perished young man around the same mountain trails on which I was running provided an eerie reminder that anything can happen to anyone. We are fragile when it comes to battling the elements and we can’t take anything for granted. I always think of the mountains as a playground and I tend to tune out potential danger. This experience reminded me to enjoy the good but also be aware of the bad. Gina training in the Sierra Nevada of California. A few days later I was in Mammoth Lakes, California. I had just set a new female FKT (fastest known time) on the Mount Whitney Portal Trail of 5:29:22 (the old record was 7:06) and was taking a recovery day SUPing on Lake Maime. I overheard a man talking about running so, naturally, I chimed in. Dave and I began to talk about various run topics, and I shared my recent achievement and running history. Dave then mentioned that his stepdaughter, Linda, was in Mammoth Lakes with her cross-country team. She is one of their coaches and was holding a pre-season camp. Gina in the Sierra Nevada. Before I knew what had happened, I was invited to the team’s campfire shindig that night to be a guest speaker. I was stoked! I have had many great and not-so-great experiences in the running world, and was happy to have the opportunity to speak to these young girls. Later on, 30 eager and excited girls circled the bonfire ready to ask questions and hear stories from a ‘pro.’ I was flattered. As the night went on and the questions kept coming, I felt fulfilled to have motivated and educated these young girls. Creating this connection with complete strangers was perhaps more meaningful than most of the conversations and relationships I have in any given day. Gina and the young women at cross-country camp. 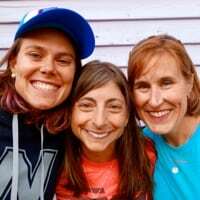 My experiences with the search for Jacob and the powwow with the girl’s team made me think about life: my closeness with it, what I choose to do with it, and how I handle myself wherever I am. I was reminded that relationships are one of the most important things a person can have. A meaningful connection with another person is more fulfilling than anything money can buy. Secondly, I thought about the importance of living life to its fullest. You never know when your last day is, in fact, your last day. Thirdly, don’t take anything for granted. Be humble and thankful for the opportunities you receive as they may not come around again. And lastly, be open to change and be flexible. For as much planning as one can do, most likely something will go haywire. If you can roll with the punches, chances are you will have a much more enjoyable time and you are likely to learn or experience something new. Not everyone will agree with my list of ‘what’s important in life,’ and that’s okay. This is my list and I’m sure you have yours. What is more important is that you get outside and go on your own adventure—do whatever it takes to help you discover the deeper meanings of your own life. I challenge you to push some limits, be a bit daring, and welcome the unexpected. Does our sport help you connect or reconnect to the most vital parts of your life? Can you tangibly describe the nature of that connection for you? What are the most important parts of your life upon which running helps you center? I read one heart-felt article after another on this site about the profound significance and life-altering experience of ultra-running but whenever I head out on trails I just end up having a nice run. What am I doing wrong?